Converting a TV show into a major motion picture is a daunting task, an endeavor noted more for its failures than for its great successes. The time constraints and dramatic structure of cinema are quite different from episodic television, requiring a deft touch in the writing department to determine how much of the original show stays and how much has to be trimmed away. In translating Firefly to the big screen, the challenge is even greater. The story is elaborate and ranges wide in theme and its stellar ensemble cast. Determining what the heart of the show is, what to keep and emphasize versus what to diminish or set aside will determine whether the film is Firefly or something lesser, or at worst something unrecognizable. Fortunately, Joss Whedon’s decisions and translation succeeded in bringing Firefly to the big screen as Serenity. Serenity is a love letter to the fans, and by action if not by design, a love letter to classical liberals of all stripes. 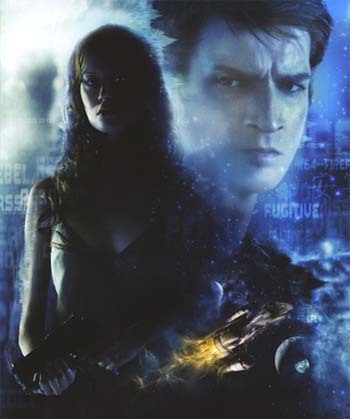 The major themes of Firefly are preserved and explored in the course of the movie, and while the story arc and action focuses mainly on the hero Malcolm Reynolds, the supporting characters also ring true. The plot is climactic, well paced, and action-packed, making the film enjoyable on a basic level even for new viewers who are not as invested in the characters as more familiar fans of the show. Joss Whedon is known for his highly arc’d television series Buffy the Vampire Slayer and Angel, and for his deft touch with characterization and dialogue. Firefly was no exception. The world felt real, the themes were complex, and they played out in the dialogue and characters of a hardscrabble semi-legal tramp freighter, scraping away a living at the edge of civilization doing whatever odd jobs came about. The series, at its heart, was a study in contrasts of two men who come to similar places in life despite starting on totally opposite sides of the fence. For these two men, Malcolm Reynolds and Simon Tam, there were three main themes that drove all of the others in Firefly, and were the ones Whedon wisely chose to concentrate on for Serenity: Autonomy, Belief, and Love. The overarching theme of the show was a study of autonomy and freedom with respect to the prevalent order in particular and authority in general. Each of the characters’ choices in their lives before the start of the movie and within it reflect this tension. Mal was on the losing side of a civil war which ended up uniting all the planets against their collective will into one grand Alliance. While the war for greater autonomy and pluralism in the ‘verse is over and lost for Mal, he maintains the struggle on his own. For Simon Tam, the autonomy he seeks is not his own, but for his damaged sister. For the rest, the ship is the place where they instantiate their autonomy, moving from planet to planet and earning a living as best they can realizing gains to trade wherever the Alliance will let them, and often despite the Alliance. The main character theme of Firefly dealt with belief. Mal lost his faith when he lost his cause, but he still believed in independence, however circumscribed. That belief led him to captain a ship and gather a crew. Simon lost his faith in civilized society and the promises of the state when he found out they abused and dehumanized his sister. That led him to give up his comfortable life in high Core society, privileged and pampered, fleeing to the rim to find some measure of peace and autonomy for his sister. The intervention of the Alliance has forced both men to be outlaws. The underlying theme of the show was love-- love of a ship (Mal, Kaylee), love of your sibling, spouse, others (Simon, River, Wash, Zoe, Book), love of money (Jayne), and love of your comrade (Mal and Zoe), or the struggle of living without love and attachment to the world (Inara). Serenity opens with a study of institutional violence in the course of keeping secrets. The Operative is introduced, a nameless assassin who admittedly and freely does evil in the name of good, believing without question that the Alliance represents the one true hope for mankind. As such, anything and everything is justified in pursuit of its goals. He is tasked with capturing the fugitive River Tam, a child prodigy the Alliance warped into a weapon. Left unstable and telepathic as a result of its experiments, she is wanted by the Alliance not only for her abilities, but because of what she inadvertently knows from careless exposure to Alliance officials with secrets they thought were safely inside their heads. The Operative kicks off the exploration of the underlying theme, by telling the viewers by way of soliloquy that Simon is dangerous because he has love, before killing everyone who was a witness to River's escape. The Operative is interesting as a counterpoint, because through him we see the danger and evil of extreme belief. He is a functional sociopath in the name of ‘the greater good’, essentially committed to destroying the village in order to save it, if need be. We then find that Mal and his crew have been pushed to ever more desperate and illegal means to stay independent. Driven out of legitimate commerce by the Alliance, they are reduced to hijacking payrolls from private defense agencies hired by the Alliance to keep the peace on the myriad border worlds where Alliance sends the underclass of the core planets. Aside from common and petty criminality, the outer rim worlds have to deal with a far more fearsome foe- Reavers. Reavers are essentially technobarbarians who live only to raid, plunder, pillage, and kill, and they plague the poor and isolated outposts of civilization. Given the ruthless and unreasoning aggression of the Reavers, when they attack the town that Mal’s company is robbing, Mal’s crew sensibly runs. In the course of his escape, Mal ruthlessly sacrifices a villager begging for help to the vicious appetites of the cannibalistic Reavers. Though he does deliver a merciful killing blow to the villager he leaves behind so as to spare him a gruesome fate, Zoe questions Mal’s cold indifference to his fellow civilized man. From this point it becomes apparent that Mal’s lack of faith and belief in anything other than survival has slowly eaten away at his soul, leaving him increasingly bitter and withdrawn from his crew. As the movie starts out we find that he has driven off Inara, and after riding roughshod over the objections and complaints of Simon he alienates the Tams as well. Kaylee is left wondering how long it will take before he runs all of them off the ship. Mal is essentially soulless without his belief, and while in the pilot episode of Firefly (also called ‘Serenity’) he claimed that while just having a ship that could fly wasn’t much, it was enough, apparently it isn’t enough in the long run. Mal at the beginning of the movie is at a nadir, an almost empty shell just going through the motions of life. He has no belief and precious little love remaining for those around him. His lack of love has made him dangerous and indifferent, an interesting parallel with the faithful Operative, whose fervent belief has left him similarly dangerous and indifferent to life around him. When the Operative uses Inara as bait for Mal, the film explores the main theme of authority & freedom- when the Operative explains to Mal that Mal cannot win against the Alliance, Mal shrugs and says, (paraphrase) “I don’t want to win. I just wanna go on my way.” In one sentence the classical liberal objections to concentrated power are encapsulated. Mal doesn’t care about power politics nor does he want to tell other people how to live their lives. He simply wants to go about his own and freely exchange value for value with others, shaping his own life and destiny as he goes, constrained only by the hard facts of scarcity in the universe and a respect for others’ autonomy. Mal rejects the entire worldview of the Alliance, where there is ruler and ruled, and you are one and no other. Following clues dribbling out of the unstable mind of River, the crew find their way to a hidden world, rumored to be an unstable failed planet where a terraforming disaster killed every colonist. It also happens to be in the midst of Reaver territory. The two facts turn out to be related as the hidden world of Miranda was designed as a gigantic social experiment by the Alliance. A calming drug introduced into the atmosphere, ostensibly to make a peaceful and compliant population instead made the inhabitants so mellow that they lost every desire including the desire to move, eat, drink, and finally breathe. And as a horrifying side effect, in a small but significant portion of the population exposed, instead of becoming torpid they became ultraviolent, aggressive, and psychotic. This latter cohort became the Reavers, who have since raided and terrorized the outer rim of civilized space for over a decade. With this revelation, Whedon makes a boldface point about top-down interventions by authorities to perfect society or mankind. Even with the best of intentions, the Alliance’s social experiment led to the direct death of millions and created a terrorist threat that continues to prey on the weak fringes of civilization without mercy. That the Alliance reacted by choosing to murder and silence those who knew the truth further implies that power corrupts and absolute power corrupts absolutely. The death of the millions on Miranda also reflects Mal’s despair and emptiness. When the government alienated the people of Miranda from their volition and desires via drug, they were left as empty shells and they laid down and died. When the same government robbed Mal and his people of their independence, he was left alienated and increasingly empty. He too was on a path to destruction until he regains a sense of purpose and ultimately takes up his old standard, deciding he’ll fight for truth and the memory of those who died, even if only to stave off the day that the Alliance or someone similar decides to try and perfect society again. As for River, the monstrous secret of Miranda is what drove her insane; upon revelation of the truth and a symbolic purging, she comes to grips with reality. It is at this point on Miranda that both Mal and River gain clarity and regain a sense of self, something critical to their survival and their friends. Through the grim climax, the other characters also begin to find purpose and love, or are saved by it. In grief Zoe loses her will to live and means to sacrifice herself, but is saved by the love of her comrades. Simon, fearing the end, realizes a greater love and declares it to Kaylee, who is in turn infused with a greater will to live because of it. Inara stands with her old companions and she, too, finds a new purpose among them. River’s love gives her the focus and determination that has eluded her for so long, allowing her to rise and defeat their foes. Love is used as the metaphor for that which drives all of us to act on our tacit knowledge, strive to overcome difficulties, and gives a reason to keep going on even when all seems lost. Love endures. In the end, the crew and the captain are reborn with purpose and in love, as is the ship. The Operative, having lost his faith in the Alliance, helps repair Mal's ship and sends the crew on their way, beginning his own journey in the wilderness of lost belief. The movie, unfortunately, does not deal with all of the themes that made Firefly a great television series. As a climactic turning point for the Firefly narrative, Serenity is sometimes unrelentingly grim in the course of transforming the story from one era to the next. By the nature of the medium the ensemble cast is reduced in service of Mal’s journey, which is unfortunate. But in the end, Joss Whedon has done an excellent job in translating Firefly from the serial to the cinema, keeping the themes that made Firefly as important and compelling as they were and weaving them into a fast paced plot filled with action that doesn’t take the cheap way out of its drama. I give it two hearty thumbs up and recommend it vigorously to fans of the TV series and non fans alike. Submitted by CMN (not verified) on Wed, 2005-10-12 07:29. Good essay. I'd be interested to see you or others go a little further into what's going on with the Operative. One can imagine a true believer who remains fundamentally unfazed by the revelation about Miranda, because he regards it as merely an unfortunate error that changes nothing about the Alliance's essentially good intentions. Given that he's clearly someone who believes in breaking eggs to make omelettes, why exactly is this particular scramble a deal breaker for him? Also, I notice that lots of libertarians like this movie, as well they should. But I haven't seen any discussion of the way Whedon has unerringly (intentionally?) highlighted the very issue that has recently caused such a divide among libertarians--the legitimacy of using government force in an attempt to eradicate terrorism. I think all libertarians read the story of Miranda as an object lesson in the evils of social engineering and inevitability of unforeseen consequences. But not all libertarians, it seems, put the GWOT or the Iraq intervention in that category. I notice that at one point you describe the Reavers as "terrorists." Which seems to be the obvious parallel Whedon is drawing. You try to force feed people with something called "pax," and you wind up turning lots of them into terrorists. Now I wouldn't want to reduce the point of the movie to a cheap contemporary political statement, and I don't think you need or are intended to. What's fascinating to me is precisely the way Whedon makes both the broader philosophical point about the imperfectibility of man and the perils of even well-intentioned totalitarian meddling therewith, and at the same time puts in clues that point to one specific application of this principle that ought to be troubling to some of the people who are expressing enthusiasm over this movie. Submitted by Peter K (not verified) on Thu, 2005-10-13 19:12. The question of why the Operative finds the debacle on Miranda a deal breaker goes to the heart of his belief system. The Operative is a true believer - there is no evidence of a nuanced view of the world that can accommodate grays. He sees the world in black and white and does not really incorporate any ambivalence into his beliefs. I find people with this kind of world view to be especially susceptible to a sudden 180 degree change in views when confronted with some sort of psychological dissonance. A person who has developed a less extreme view of the world can often incorporate unexpected events without drastically modifying their world view as they are accustomed to dealing with ambivalence and ambiguity. The true believers are left to either ignore the new reality or more or less completely jettison their beliefs. I have seen this happen and it always seems a bit unsettling but it does happen. Either that or Joss just indulged in some lazy writing (which I don't really believe). As far as the political issue of Miranda, this is a typical case of blow-back. Want to help destabilize the Soviet Union? Why don’t we arm the mujahedeen with stinger missiles etc. Oops – now they want to use them on us. Upset by the Iranians, how about arming Hussein to fight a proxy war. He would never turn against us, would he? The old “No good deed goes unpunished” argument. This whole "perfecting humans" issue has been a theme of Joss’ work (see Jasmine in season 4 of Angel – played by Gina Torres who also plays Zoe in Serenity). I think the point Joss is making is the danger of arrogance and hubris. Whenever you are convinced of the “good” of your cause, you better step back and reexamine. Be wary of anyone who sees the world as divided into good and evil because they are either deluded or they are trying to manipulate you, possibly (probably) both. Free will is messy, in fact freedom in general is messy but it is essential if we wish to be all we can be. Anyway, this is just my take on it (showing proper amount of humble self doubt). Submitted by Mark (not verified) on Wed, 2005-11-02 16:08. Submitted by Me Am Hulk (not verified) on Wed, 2006-01-04 18:15. CMN asked why the Operative would be fazed at all by the fate of Miranda and the creation of the Reavers. In my opinion, it is because the Operative never had to see the ultimate result in his unflagging loyalty to the Alliance until the crew of the Serenity literally brings the chickens home to roost. In his character's exit from the film, he is not - in my opinion - simply removing himself from Mal's sight. He is also removing himself from the sight of the Alliance. He knows their greatest crime, and his faith in them has been betrayed. Among the slain central characters of "Serenity" is the pilgrim Shepherd Derrial Book. Book's character has been freighted by Joss Whedon with a belligerent past that was gradually being revealed by the "Firefly" series. Book may very well have been a lackey of the Alliance or some other entity who lost his unswerving alleigance, and taken up a life as a preacher to purge wrongdoing committed by his own two hands. With his death at Haven, there is now a void in the narrative left unfilled. Isn't it probable that the Operative, being bereft of and in need of a cause, may find solace - as Book did - training to be a Shepherd?